Ahhh....finally!! An original slasher film that we have all been waiting for! I mean...listen to this plot! At a local summer camp, a legend exists about a hockey-masked killer named Trevor Moorehouse who slaughters anybody who happens to get into his path! Low and behold, a group of camp counselors show up to open Camp Placid Pines, only to be murdered off one by one a hockey-masked killer! Seriously...how did the writer ever come up with such a unique idea? Please! What a complete rip-off this movie is! And worse yet...it is an absolutely worthless, horrible rip-off! I am very surprised that the people involved with Friday the 13th didn't throw a fit with this film. My only explanation is that they actually watched this piece of crap and realized it wasn't worth worrying about. To be fair, the fact that this is an obvious Friday the 13th rip-off wouldn't bother me so much if it was decent. What bothers me is that this is a lazy, unscary, ridiculously plotted film that attempts to do nothing original whatsoever. We even get the resident crazy local who warns the kids of their impending doom, but gets ignored. 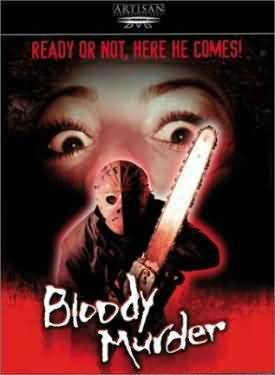 But unlike its much superior inspiration, Bloody Murder is a clumsy movie that lacks both scares and atmosphere. Most of the kills are bloodless, which is a no-no when you are inspired and basically copying the film that brought on the gore and slash trend the 80's. Almost all of the murders take place in DAYLIGHT and the final confrontation even takes place in DAYLIGHT and has to be one of the most ridiculous final confrontations I have ever seen. Moreover, the acting is terrible and the heroine (Jessica Morris) is such a wooden actress that it really becomes distracting any time she is on screen. She shows zero emotion and most of the lines by the actors are delivered like the are being read off a cue card. Let's face it....she is no Adrienne King. There is the typical 90's slasher flick cliche of the red-herring suspect who actually gets arrested based on a muddy boot print! Of course, to anyone paying even half attention to the film will now who the real killer is in the first twenty minutes. That's right...it's NOT this Trevor Moorehouse character (don't worry...this isn't a spoiler...you'd have to be an idiot not to figure it out! ), which makes me wonder why the filmmakers developed his character and back story anyway, let alone have him wear a HOCKEY MASK while killing! They had to know the criticism that would come from doing this, so I do not feel bad dishing it out. The only positive thing I can say about this film is that the pacing is pretty okay, so it doesn't drag on or really get boring. And just about the time you want to shut it off because you are tired of the lame kills and cheesy acting and dialogue, it ends. In the end, ignoring the blatant rip-off that this film is, it still is not a very good film at all. As mentioned, it lacks scares, atmosphere, originality, decent performances, competent direction, and basically everything else that makes a good horror movie. Still, I know that for some unknown reason, this film does have its fans; I simply am not one of them. But, check it out, formg straigh your own opinions. I think your time would be better spent watching any of the Friday the 13th films, or goint to this films sequel, which is surprisingly much, much better!